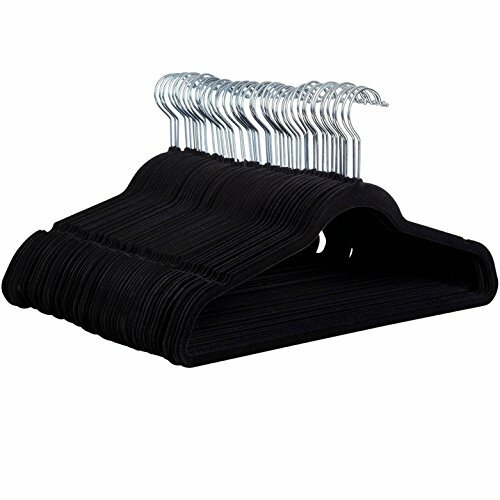 Upgrade and de-clutter your closet with 50 attractive black velvet hangers. Made of high quality materials, these hangers are built to last. The shoulder line is contoured to help preserve clothes shape and features precisely cut notches for keeping straps in place; no more hanger marks on fine knits or damaging shoulder bulges. Their sturdy, yet lightweight construction can withstand a maximum weight of 10 pounds; hanging heavy outerwear like winter coats like a charm! The soft texture of the hangers grip delicate items such as camisoles and tanks with ease as the velvet material clings on to clothing preventing slipping. The shiny chrome stainless steel hook has a 360 degree swivel capability making it easier to hang and access clothes. The pant hangers feature a horizontal bar that is covered in luxurious velvet that both grips and prevents creases. The slim profile of these space-saving hangers can free up to 50 percent more space on your garment rack; perfect for college dorm rooms and tiny closets. These hangers keep full-figured tops and outerwear securely in place! The velvet material clings on and keeps clothing with wider shoulders in place. Note: Avoid hanging wet clothing on the hangers as the material could leave dark residue behind.